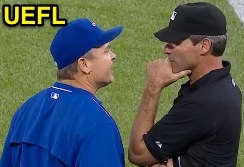 1B Umpire Angel Hernandez ejected Blue Jays Manager John Gibbons for arguing a strike three (check swing) call in the bottom of the 2nd inning of the Marlins-Blue Jays game. With none on and one out, Blue Jays batter Jose Bautista attempted to check his swing on a 1-2 curveball from Marlins pitcher Andre Rienzo. Play was reviewed and affirmed by the UEFL Appeals Board (7-0-0), the call was correct. At the time of the ejection, the Blue Jays were leading, 7-0. The Blue Jays ultimately won the contest, 11-3. This is Angel Hernandez (55)'s second ejection of 2015. Angel Hernandez now has ? points in the UEFL Standings (-2 Previous + 2 MLB + ? = ?). Crew Chief Ted Barrett now has ? points in Crew Division (-3 Previous + ? Call = ?). *Points do not display for Check Swing cases. This is the 79th ejection of the 2015 MLB Regular Season. This is the 36th Manager ejection of 2015. This is the Blue Jays' 1st ejection of 2015, 5th in the AL East (BAL 4; BOS, NYY 3; TB 2; TOR 1). This is John Gibbons' first ejection since July 2, 2014 (Greg Gibson; QOC = Y [Replay Review]). This is Angel Hernandez's first ejection since May 29, 2015 (Ryne Sandberg; QOC = N-C [Check Swing]).